Its pretty quiet around here this afternoon. Ari is at kindy and The King is sleeping the lunch sleep of the 12 month old, we are at two hours and counting. Lady Moss is at the helm of the sewing machine and I’m hanging out inside my own head which doesn’t happen as often as it used to but quite nice when it does. I’ll leave you in her capable hands and let her count you in on what she has been making. Welcome! Its beginning to feel a little like Santa’s Workshop in the sewing room today. I’m trying to make as many gifts as I can this year and those that I am planning to buy for have had their pressies ordered or at least put down on the list to check twice. I have a huge aversion to going out and buying something for the sake of it and feel that anything made with love and while I’m at my calmest, which is in front of the machine, wine in hand is so much nicer than anything I could buy. Based on the idea of the old school paper bag, these are ideal for holding lunches, nappies and wipes and have even been called in to carry wet gear after a play in the Hyde Park Fountain. I first saw the idea in The Crafty Minx but found an easier pattern on Calico that I have based this one on. 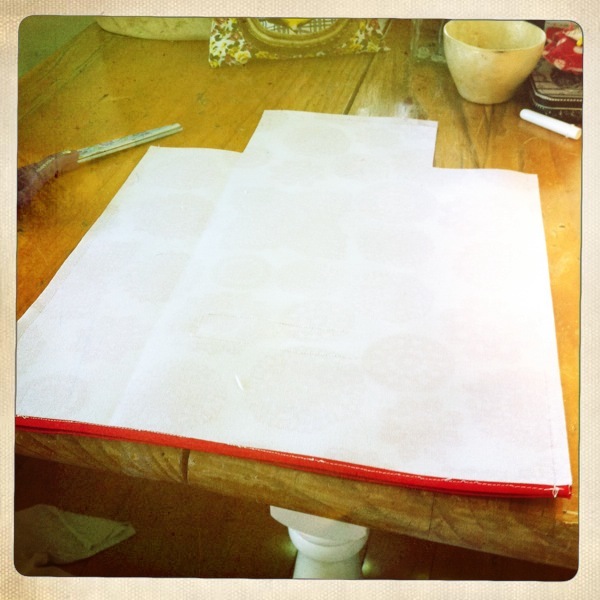 You will need a sheet of oil cloth big enough to cut two 10×15 inch pieces from. Half a metre would do it, but I like to buy a full metre when I can and make a few sacks in different sizes for different uses. I recently made a matching set for our new Silver Cross double stroller in beige with white polka dots. I do feel better knowing that I’m well accessorised when driving a pram that has been the royal choice for centuries. I buy my oilcloth from No Chintz in Balmain. Their range is divine and you won’t see it in any of the kids stores selling oilcloth accessories. I just feel calmer when I walk into that shop its so beautifully laid out with a big cutting table in the centre, the most strokable fabrics and I’m obsessed with a throw they have in the window using squares of recycled wool. Using a slicer and cutting board if you have one or a ruler and scissors if not, cut two rectangles of 10 x 15 inches from your oilcloth. 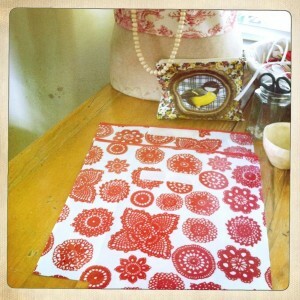 Lay your pieces flat and slice/cut out the two bottom corners on the long side measuring 3 x 3 inches. 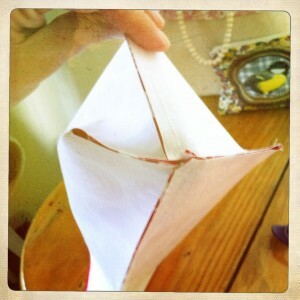 Keep your scraps as I’m thinking about a craft activity we can use them for, waste not want not I say! I like a nice finished edge on my projects, anything else just looks unkempt, so at this stage I use double sided binding and sew along the top edge on both pieces. You could simply turn under and top stitch along the edges if you don’t have any binding. Even a zigzag stitch in a different colour could be fun. I then sew some Velcro to keep my sack closed and neat. I buy mine from a little old lady at The Rozelle Markets. 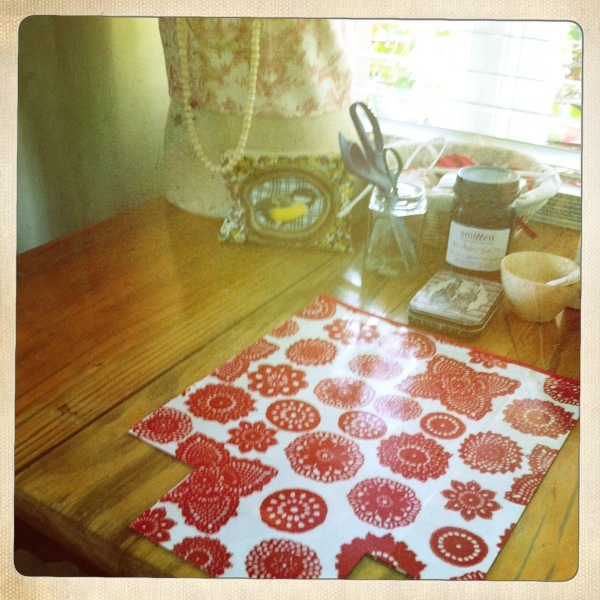 She has a table filled with sewing notions. I also get my binding, rickrack, zips etc there when I can. I so much prefer to give her my money than the big chains and her stuff is so cheap I always give her some extra. Makes me happy. Next pin a piece of Velcro approx 6 inches long on the centre top of the printed side of one of your oilcloth rectangles. Placing the pieces wrong sides together, roll your cloth over twice to measure where the corresponding piece of Velcro should go on the other piece of oilcloth. Pin and sew along the edges of the Velcro, doubling back at the end for strength. This is where the fun begins and very soon you will be done! 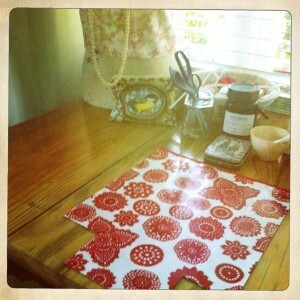 Place your oilcloth pieces right sides together (printed sides), matching the bottom corners especially well. 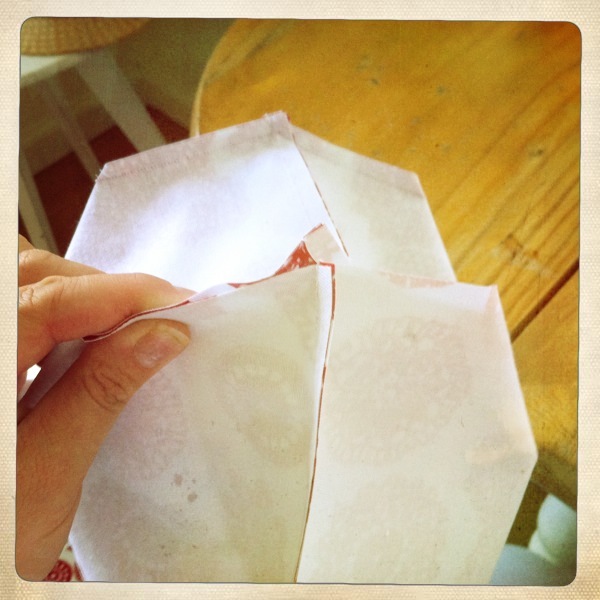 Sew the side edges together using a ¼ inch seam. If you have a ¼ inch foot lucky you, these are the best, if not just keep your edges as neat and clean as possible. Sew the bottom edge together also using a ¼ inch seam. Open the bag slightly and place the bottom corner edges together as shown in the photo. This will form the paper bag shape. Hold as firmly as you can and slowly sew. I double back on my edges here for extra strength. Tip: when you reach halfway and need to turn your fabric slightly, leave the needle down in the fabric, lift the foot and move your fabric. This will keep your nice even ¼ inch edge. Perfection! Once you are finished sewing simply turn the bag out the right way, push out the corners, fold your sides in, fill bag with cupcakes, roll down and Velcro securely. You are now ready for a walk to the park once the children wake up. 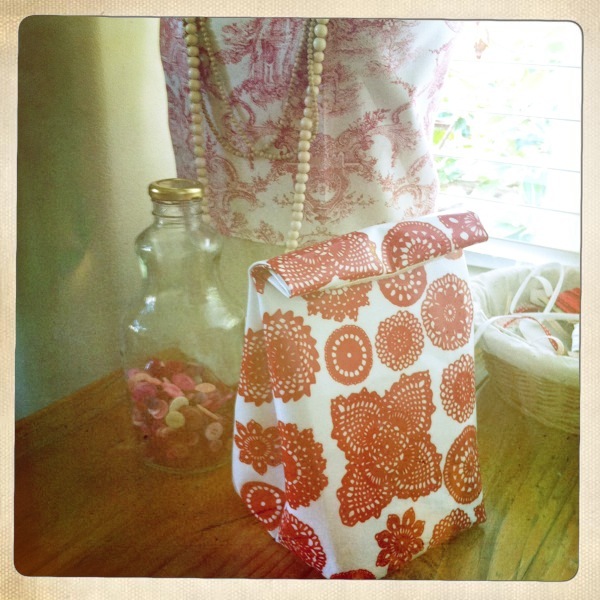 Note: I use this basic pattern to make different sized bags. Just measure your rectangle keeping about 2/3 inches difference for the long and short sides. You then simply make sure the bottom cut outs are a perfect square and you will be fine. I also like to make handles from the oilcloth and attach to the top edges of the sacks firmly instead of Velcro to make a bag to hang from the pram handles. Happy Friday! Things that have made me smile this week. Love it ! And so simple ! Love your step by step instructions ! Awesome blog, It’s so infomative and usefull, thanks a lot! If you post more of this great stuff, I’ll visit your blog again!